Handtrucks2go is the only name you will need to know when shopping for an electric powered platform cart. We have the best selection of power drive flatbed carts as well as extremely competitive pricing. For a larger selection, make sure to see all of our electric powered hand trucks. Need help figuring out which one is right for you? Call one of our friendly specialists at 888-811-5941 today! 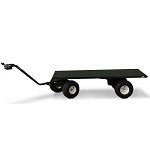 Outdoor Electric Platform Cart with Big Rugged Wheels - 30"x48"
Browse the best selection of motorized platform trucks at Handtrucks2go.com! Here in handtruckstogo, we take platform carts to a whole new level. If you're looking for a more efficient and convenient way of moving and carrying things around, then we got the tools for you! We make sure you'll find the perfect product that fits your need at an affordable price. In this category, you are given the option to operate the cart manually or power-driven. This saves you time, effort and manpower which will surely help you save money in the long run. If you are not yet convinced, stay for a while and browse. We have multiple renowned manufacturers such as Vestil, Wesco, Ace, EK-TECH and many more so you don’t need to worry about the durability and quality of these products! We also bring you a variety of options regarding weight capacities, size of platform, wheel type, and other accessories that might be the one you’re looking for. Some platform carts come with push-button release, anti-impact corners, and non-skid decks. Some platform carts may require you to assemble and customize it on your own making them extremely flexible and versatile. That way you are able to create a platform cart that specializes on any kind of work you want it to be. 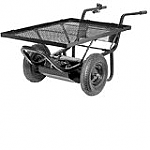 Speaking of work, you can use these carts for most general material handling activities such as home improvement projects, warehousing, moving home supplies, hobbies, garage endeavors, in hospitals, schools, transporting books and more! As mentioned earlier, you will find platform carts with different shapes and sizes like for example, some have very wide platforms so they can fit very big objects. This is good for doing heavy duty tasks like carrying equipment from point A to point B effortlessly. Since it is power driven, this can be done by a single person freeing up excess manpower to do something else. The instructions and descriptions regarding the carts are well written on this site and are also provided by the manufacturer themselves making it simple to follow and easy to understand. With a large range of sizes, you can surely find carts big or small enough to get the job done. Some of them are easily collapsible and can fit into storage requiring minimal space. If you also transport a large number of materials on a daily basis, then check out the filters written on the left-hand side of the site and look for load capacity, this will surely help you narrow down your search making it easier for you to choose. 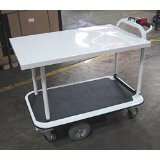 Are you a contractor, then you need a motorized platform cart! Come browse our wide selection of platform carts that are perfect for lugging all your construction needs. If you have a retail store you may also be interested in our platform carts too. Make us your last stop as we offer the best prices and we guarantee that!